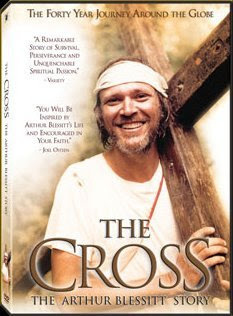 Last night our church showed the movie "The Cross"... the story of Arthur Blessitt. If you've never heard of this man, let me tell you a little about him. Arther Blessitt began as a preacher on the Sunset Strip. He ministered and shared the love of Jesus to those who others may say are unworthy. Hippies, hookers, drug addicts, Hell's Angels, rock stars and more. He has a heart to love people. ALL people. In 1968, he said that God told him to take his cross and start walking across America. Two weeks before he was scheduled to leave, he found himself in the hospital, with a brain aneurysm. Faced with the news that any excessive walking or heavy lifting could cause the aneurysm to burst and kill him, he decided that he would rather die doing the will of God, than live outside of it. He said that his circumstances did not alter the call of God on his life... so he headed out, as planned, on Christmas day. Now, after more than 40 years, Arthur has walked the world over. He's been listed in the Guinness Book of World Records for "World's Longest Walk", walking through 315 countries, walking on every continent, and crossing every ocean. He has shared the love of Jesus with every people group, of every language. He has walked through places that no one else would go, knowing that God was sending him. Arthur Blessitt is a humble man. He's seen many miracles, and he gives all the Glory to God, and God alone. He says... "I am unworthy to be called by God- but my unworthiness does not disqualify me from the call of God." I'm very excited for the weekend ahead. Arthur is coming to my city, Las Vegas, to carry the cross down Fremont Street, and share the love of Jesus. I know God is working in Vegas. I miss the days when christians had a heart for the lost, and I'm hoping this weekend will restore that passion in me, and in others. Lord, give us a heart to reach the lost for You. Bless this event and use it to Your Glory. In Jesus' name. Amen. Thanks Lori! The movie was great. So motivating. Thanks for your prayers. It's raining today... but I know the Lord can still bring the people out. I can't wait! Lemi Shine. A Dishwasher Miracle. My Way Or The HIGHway?... HE orders my steps.